Compare to Uline S-16732 and Save! 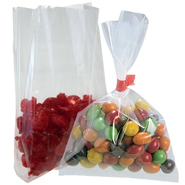 These resealable 8" x 10" 4 Mil VCI Bags consist of Low Density Polyethylene film (LDPE) with a corrosion inhibitor. 8 x 10 4 Mil Zipper Locking Poly Bags with Vapor Corrosion Inhibitor have a Zipper Locking top for repeated access to parts.